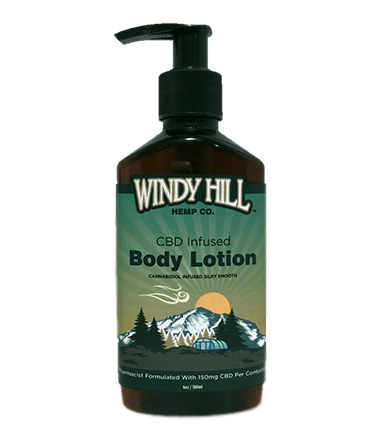 Windy Hill Hemp CBD Infused Body Lotion is CBD hemp oil extract infused into a luxurious moisturizing base to replenish and moisturize even the driest skin. 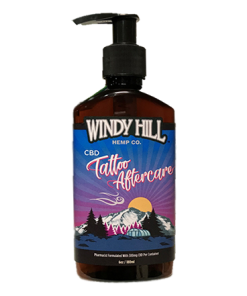 Windy Hill Hemp CBD Hemp Hand & Body Lotion is CBD hemp concentrate infused into a moisturizing base specifically formulated by our pharmacist to provide a luxurious moisturizer intended for daily use. 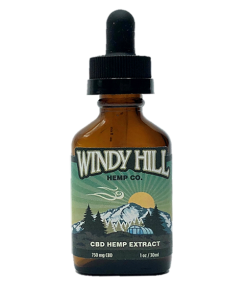 Windy Hill Hemp CBD Infused Body Lotion is made from premium quality, naturally grown, whole flower industrial hemp right from our own farm in Colorado. All Windy Hill Hemp products are batch tracked and laboratory tested as well as formulated and manufactured by a pharmacist. Recommended Use: Apply lotion to skin once daily or as needed. Storage & Directions: Store in a cool dry place. Protect from sunlight. Keep out of reach of children. Consult a physician if you are pregnant or breastfeeding. Active Ingredients: CBD 150mg per Container, THC less than 0.3% per Container. Other Ingredients: Purified Water, Aloe Vera, Sweet Almond Oil, Apricot Kernel Oil, Cetyl Alcohol, Glyceryl Stearate, PEG 100 Stearate, Glycerin, Panthenol, Silk Amino Acids, Olive Oil, Vitamin E, Phenyoxyethanol, Ethylhexylglycerin, Sodium Acrylate, Acryloyldimethyl Taurate Copolymer, Isohexadecane, Polysorbate 80, Fragrance, Allantoin. Products are shipped via USPS Priority Mail with tracking provided on every order. Priority Mail normally takes 2-3 business days. Orders under $100 have a $5.99 flat rate shipping fee and orders over $100 ship free. Cancellations – You may cancel an order that has not shipped yet by emailing info@windyhillhemp.com or calling us at 1-303-803-0530. 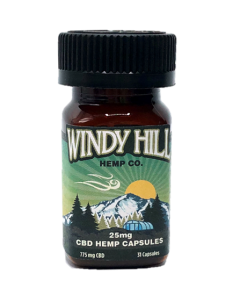 Refunds – Windy Hill Hemp products are backed by a 30 day satisfaction guarantee. If you are not satisfied with your purchase, please contact us at 303-803-0530 or emailinfo@windyhillhemp.com within 30 days of your purchase to request a full refund. The customer is responsible for the shipping and handling costs of returns. Refunds are also allowed for damaged products or products shipped in error. If you have received a damaged product or an incorrect item, please contact us at 1-303-803-0530 or email info@windyhillhemp.com within 14 days to request a refund or replacement for your purchase. All of the Items I've used, the rub releases the pain, lotion smoothes the skin super moist and the capsules well I feel energized an no more aches or pains…the customer service is top notch!